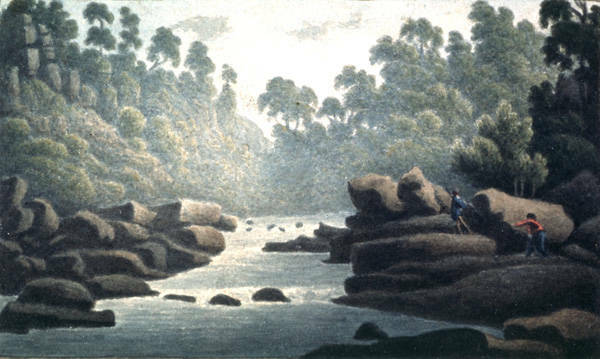 John Glover (1767–1849), artist, commenced his career as a drawing master. Riding to prominence on the 1800s fashion for watercolour, he became one of the most successful British landscape painters of his age. Glover migrated to Van Diemen's Land in 1831, and took up land at Mills' Plains in the colony's mid-north. Despite his age (64) and the handicaps of great physical bulk and club feet, he established a successful property, named Patterdale after a village in the Lake District. A similar nostalgia informed Glover's paintings of the new land, which often employ conventional Picturesque compositional and decorative devices. However, he was also a sensitive observer and recorder, providing the first convincing and comfortable representations of the Australian landscape, with its bright blue skies and golden light, twisting eucalypts and grey-blue-olive foliage, Aboriginal inhabitants and empty distances. In these remarkable 1830s paintings, Glover is arguably the most important landscape painter working outside Europe. Further reading: D Hansen, John Glover and the colonial picturesqu, Hobart, 2003.